The Easter bunny will be hopping all over Queensland over the next week or so, and we’ve narrowed down just a few of the places you’ll be able to catch him (and even score yourself some chocolate, too!). Who says your pooch has to miss out on the Easter fun?! In a Brisbane first, your pup can join in on the hunt for dog-friendly Easter treats. The fun event – hosted by Mad Paws at Kalinga Park – will offer plenty of prizes for the dogs who track down the most Easter treats, and is a guaranteed day of fun for people and pooches alike. It corresponds with simultaneous hunts in Sydney, Canberra, Darwin and Melbourne. The annual Easter Scavenger Hunt returns to Capalaba, much to the delight of local parents and children. On Easter Saturday join in on the fun, with Easter Egg Basket making and face painting from 11am ‘til 1pm, a mini scavenger hunt and craft activity at the Victoria Point Tavern from 1.30pm ‘til 3pm, and a scavenger hunt at the Redland Bay Hotel from 3.30pm – there will also be an Easter party with a jumping castle, a Madonna tribute and the LOL crew will be there, too. Visit all three venues and collect the stamps to receive a free gift! The family-favourite favourite, Easter at Frascott, returns to Frascott Park this weekend, to give you an early taste of Easter fun! There’s something for all ages with free kids’ activities, face painting, an animal petting zoo, jumping castle, delicious food and much more. And, be sure to bring your rug and secure your spot on the grass for a Movies under the Stars screening of ‘Peter Rabbit’ at 7pm. The event is totally free, so head on down and enjoy the fun – it’s all brought to you by Councillor Hermann Vorster for Division 11, Love this City and OurChurch. For ten years, Madeleine Hicks Real Estate have hosted the ultimate Easter Egg Hunt in Teralba Park – this year could be their biggest yet. With some 50,000 eggs to be hunted, children will be separated into two age groups (under fours, and five and up) and children will be given their own bags to collect their eggs. There is also plenty of space for families and friends to spread out and enjoy the Easter festivities, but there might be some crowding when one very special bunny pays a visit… Expect free face painting, egg and spoon races, potato sack races, blow-up soccer and much more. Score some FREE chocolate and meet the Easter Bunny himself at Pacific Fair this Easter! The Easter Bunny will be hopping around the centre to meet and greet kids and hand out free chocolate eggs, so make sure you hang around and try to spot him! 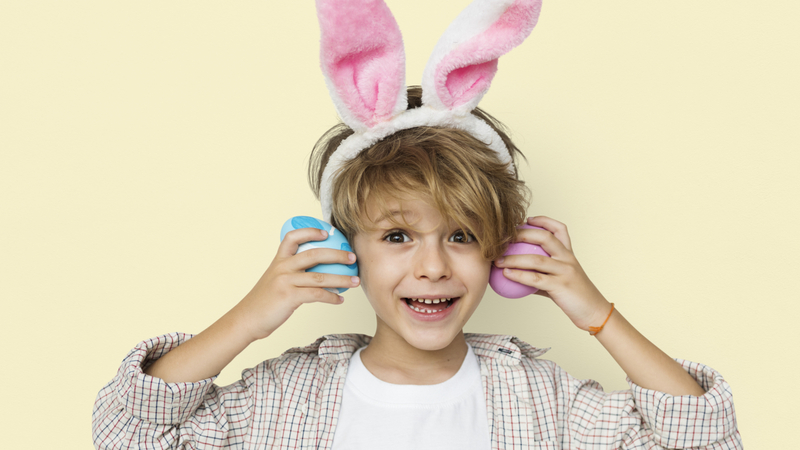 Free Easter activities abound at Circle on Cavill! In one massive celebration of all things Easter, chocolate and family-friendly entertainment, the precinct will host a hopping good time with face painting, Easter Egg Hunts, a special screening of Easter-inspired movie Hop, and special visits from the Easter Bunny. Brightly covered eggs will be carefully hidden throughout the Circle on Cavill centre, encouraging little hunters to track down their treasure. Easter Egg Hunts will be held throughout the afternoon at 3.30pm, 4pm, and 4.30pm, while lucky looters will find something shinier than a foil-covered chocolate delight as Golden Tickets will also be hidden on the hunt, entitling their finder to redeem bigger chocolate prizes and gifts from the Circle on Cavill tenants. Not one to miss out on an egg hunt, the Easter Bunny will be at the precinct from 3.30pm to 5.30pm to join in all the egg-xploring and to make sure every child at Easter on Cavill receives a chocolate treat! Stop by the Stamford Plaza Brisbane hotel over the Easter long weekend to enjoy plenty of Easter fun! From their famous Easter Buffet and the Mad Hatter’s High Tea, to fun Easter Sunday activities for kids, egg hunt included, the Stamford Plaza is certainly the place to be this Easter. For a special treat, enjoy riverside dining at The Brasserie and create your own platter, selecting from their premium seafood bounty with savoury hot and cold dishes, fresh salads, indulgent dessert and cheese selections. Dreamworld is urging all Australians to stay true to their roots and help protect our native endangered animals this Easter! By choosing bilbies, not bunnies, you will be supporting a national conservation campaign that endeavours to support these now-endangered little Aussie natives. With every Pink Lady Easter Bilby chocolate purchased, a portion of the profits will go straight to the Save the Bilby Fund. And, if you want to do even more to save the bilbies, come along to Dreamworld during the Easter long weekend for tonnes of fun activities that will educate and entertain all at once. Expect colouring-in, cookie decorating, face painting and live bilby talks across the park, with a portion of the proceeds going to Dreamworld’s Wildlife Foundation. 20 Prospect Road, Mitchelton, is set to come alive with Easter fun when the North Brisbane Easter Festival returns! This free family-friendly festival is back for another year, bring an Easter egg hunt, fun inflatables activities, food trucks, a photo booth, a chai tent, a graffiti wall, a petting zoo, awesome live music, games, competitions and more along with it! It’s that time of year again! The annual Cystic Fibrosis QLD Easter Egg Hunt returns, this year taking over their new, much bigger venue at the Mudgeeraba Showgrounds! Be sure to get there from 8.30am to register for the huge hunt, which kicks off at 9.30am sharp. For just a $5 donation to Cystic Fibrosis QLD, your children can participate in the fun Easter egg hunt. Then, enjoy the sausage sizzle, pony rides, jumping castle, a cool reptile show, face painting and plenty of food and coffee vans. The cheeky Easter Bunny has hidden hundreds of golden golf balls in Topgolf’s ball dispensers – every time you dispense a golden ball, you’ll win an instant prize! With retail items, gift cards, food and beverage items and more up for grabs, you’re going to want to play, play, play until you find one (and don’t worry… golden golf balls will register as a practise ball in your game). There will also be heaps of fun and activities for everyone to enjoy – while the kids aren’t playing Topgolf, they can join in on an Easter Colouring Competition for the chance to win a prize pack, participate in Easter Egg hunts from 9am daily during the Easter Long Weekend and maybe even run into the Easter Bunny while they’re there! The Easter Bunny is on his way to Victoria Park and this year, the celebration will last all weekend long! The egg-stravagant weekend will include loads of Easter activities, like egg and spoon races, giant games, a jumping castle, a petting zoo, kids’ face painting, live music, Easter crafts and more. All visitors dining in the Bistro or playing on the Putt Putt & Driving Range on Easter Weekend are welcome to come along and get in on the fun – just be sure you’re there when the Easter Bunny pays a visit on Easter Sunday! You’ll spot him roaming around Victoria Park between 9am and 2pm, with Mrs Bunny herself! Sirromet Winery is best known for sunny days on the green and delicious drops, but this Easter, it will be a hot-spot for chocolate-fuelled fun, too! Hop into Sirromet from 10 for the best family day out, where the Easter Bunny will be delivering eggs and there will be pumping live music, kids’ rides, food trucks and a trackless train. Plus, there’s free Supagolf for the kids – no bookings required! Are you ready for Australia’s biggest Easter egg hunt?! The team at the Sandstone Point Hotel certainly know how to throw a party, and their Easter Eggstraviganza is the proof in the pudding. Over 6000 Easter eggs will be strewn across the venue on Easter Sunday, all waiting to be found (and gobbled up!). Hop along for live entertainment, kids’ rides, a visit from the Easter Bunny himself and so much more! Oh, did we mention that entry is free?! The Mayor and the combined churches of the Gold Coast present Easter United! After selling out at HOTA last year, this year’s Easter United will be held at Broadwater Parklands (south end closer to the Sundale Bridge), so there will be even more room for everyone! Kicking off the official program, the traditional celebration will begin at 5pm before the main worship celebration at 6pm – there will also be entertainment between the celebrations. Bring your friends and family and join in the atmosphere on Easter Sunday in this fun, FREE public event, which comes complete with food trucks offering food and drink from 4.15pm. Seating is on the lawn in front of the outdoor stage, so bring a picnic rug or low back picnic chair to sit on. Indooroopilly Shopping Centre will be giving away 1.8 tonnes worth of chocolate this Easter! The Easter bunny will be leaving treats at the shopping centre’s festive maze for the entire duration of the school holidays giving families plenty of time to join the Giant Easter Maze and Easter Bunny Hunt, and provide much needed school holiday distractions. Previous PostThe Grand Get Down!